Marginally Attached Worker - What Does It Mean? 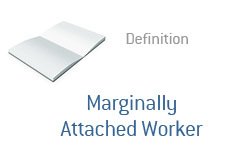 What is the definition of a "marginally attached" worker? Who qualifies as a "marginally attached" worker? According to the Bureau of Labor Statistics (BLS), there were approximately 2.5 million "marginally attached" workers in the United States as of December, 2009. What does "marginally attached" mean exactly? A "marginally attached" worker is not considered to be either employed or unemployed, so they are not included in the "official" unemployment number that is released by the US government every month. Why? Because they have not actively looked for work in the past 4 weeks, so this disqualifies them from being considered as "unemployed". A "marginally attached" worker may be currently attending school in an effort to strengthen their resume. They may have stopped actively looking for work so that they can attend to some family issues. As mentioned, a "marginally attached" worker is someone who wants a job, has looked for a job sometime in the past 12 months, but is currently not "actively" looking for work. The "marginally attached" worker, as mentioned, is not included in the "official" unemployment rate that is released by the government every month. However, the "marginally attached" worker is included in the U-6 unemployment rate, which is considered to be a broader measure of labor under-utilization in the United States.